Error in Text. 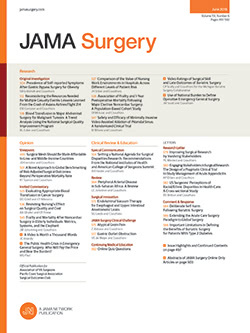 In the paper by Gali et al titled “Right Hepatectomy for Living Liver Donation vs Right Hepatectomy for Disease: Intraoperative and Immediate Postoperative Comparison,” published in the May issue of the Archives (2007;142:467-472), an error occurred in the first paragraph of the text on page 467. In that paragraph, the second sentence should have read as follows: “Since 1988, 2085 adult LD liver transplantations have been performed in the United States.1” This article was corrected on May 21, 2007, prior to publication of the correction in print.